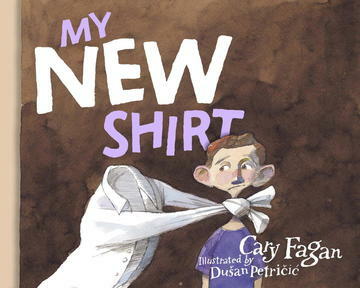 In My New Shirt, by Cary Fagan, illustrated by Dusan Petricic, David gets the same gift from his Bubbie every year—a stiff buttoned-up white collar shirt. Exactly what he doesn't want. So how does the gift end up flying out the window? And in the mouth of his dog Pupik, chased through the neighbourhood, collecting mud and borscht stains? David thinks he's ended the white shirt tradition until Bubbie performs a laundry miracle and scrubs it back to new. So how does it end up out the window a second time? 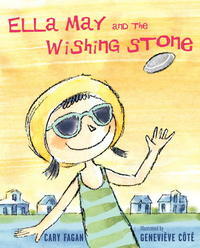 In another of Fagan's books, Ella May and the Wishing Stone, illustrated by Genevieve Cote, a deception is born of jealousy. Ella May has a wishing stone (one with a white stripe all the way round) and lords it over Manuel. Manuel designs a wishing stone machine to create his own stones, but all is revealed when the white lines (CHALK!) are washed clean with the rain. Ella May takes charge and makes each of her friends' aspirations come true in a creative, thoughtful way. 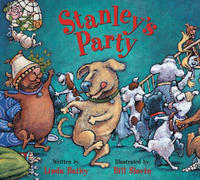 In Stanley's Party, by Linda Bailey, illustrated by Bill Slavin, Stanley is a dog who follows the rules. Until one day he thinks he might like to sit on the couch, just once, while his people are out. As long as he appears to be at the door, wagging his tail, when they come home, he's still a “good dog.” But temptation is a slippery slope and soon Stanley is turning on the stereo, raiding the fridge and inviting the neighbourhood dogs over to share in all the fun. His charade comes to a halt when his people come home early. 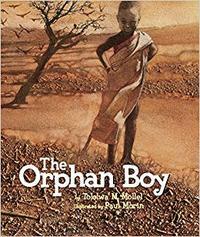 Canadian Paul Morin has illustrated the African tale, The Orphan Boy, by Tolowa M. Mollel. An old Masai man lives alone beneath the starry sky. On the same night he notices a star missing, an orphan boy, Kilekan, appears, offering to be his companion. The child offers to make the old man's tea, takes his cows to pasture, and soon completes more and more chores. The man wonders how he could possibly do all these things. Kilekan tells him it's a secret and it must remain so. But the man's curiosity gets the better of him. The boy disappears once the truth is revealed. Robert Munsch has a few stories that deal with bending the truth. 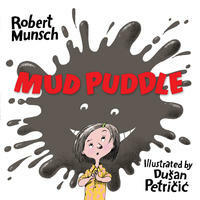 In Mud Puddle, illustrated by Sami Suomalainen (or Dusan Petricic in the newer publication), Jule Ann heads out of the house to play in her clean new clothes, and each time, a mud puddle jumps on her. At least, that's what she tells her mom each time she comes back caked in dirt. 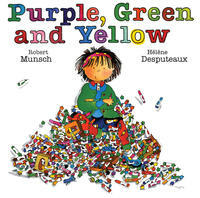 In Munsch's Purple, Green and Yellow, illustrated by Helene Dusputeaux, Brigid promises not to draw on anything but paper with her new markers. But she disobeys her mom, starting with her fingernails, using “never-come-off-till-you're-dead-and-maybe-even-later” markers. Soon her whole body looks like a rainbow and Brigid must do some creative problem-solving so her mom won't find out. 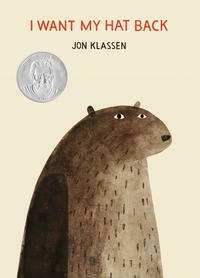 The lies are more obvious in two of Jon Klassen's books. In This is Not My Hat, Little Fish tells the reader up front he's stolen a hat from big fish. He escapes to the tall reeds, confident that a watching crab won't give away his hiding spot. But crab deceives him. Little Fish gets his comeuppance and along the way, the reader gets to make some great inferences. Two big fibs are told in Klassen’s I Want My Hat Back. Bear is missing his hat. He asks a series of animals if they've seen it. When Bear realizes rabbit has lied to him, the whole page appears red with capitalized text (inviting another inference.) In the end, Bear needs to cover up what's happened to the rabbit-thief with his own bear-faced lie.